Fostering may be used to establish an exotic species,8 to rescue chicks or eggs in the event that the biological parents cannot adequately care for them, or to increase productivity of the parent birds by stimulating them to start another clutch once their eggs/chicks are removed.8,16 If you are going to use fostering as a means to increase production, you should still limit your egg-laying hens to three clutches per breeding season so that the demand on the hen's body does not become too great. Likewise, you should limit your foster pairs to three clutches per season since chick rearing is such a demanding job. Several problems may result from fostering (or attempting to foster) finches. First, foster parents might not accept the eggs and chicks which are placed in their care.16 Second, if you are fostering chicks because their biological parents lack the requisite rearing skills to care for them, you may be inadvertently placing a selection pressure on that undesirable trait. A finch's ability to raise its own young is a skill which may not be solely a learned behavior, but have a genetic basis. By fostering the young from an unreliable pair, you are artificially selecting for what nature is attempting to select against: poor parenting skills. 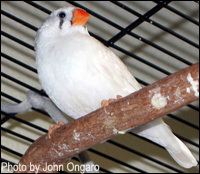 Society (aka Bengalese) finches are the most commonly used (and will breed year-round), but zebra finches or even another pair of the same species which you are trying to foster may also work. The foster parents should be chosen based on their parenting skills and not their color mutation.8 If time permits, allow unproven pairs to raise a clutch of their own chicks; doing so will allow you to evaluate their potential as foster parents.8 Using a second pair of the same species as foster parents is ideal because imprinting no longer becomes an issue. Regardless of the species you select as foster parents, make sure that the birds you choose are healthy and free of protozoa, bacteria, and other pathogens that may cause illness or death in the chicks. In order for most potential foster parents to accept eggs or chicks from another pair, they need to be on the same page as the birds they are accepting eggs/chicks from. The foster pair must be set up for breeding to stimulate nesting behavior at or around the same time that the parent birds begin to breed. For best results, house each foster pair in their own enclosure. This is especially important for society finches who often prefer socializing with other munias (when given the option) over breeding. Note that in some cases, a trio of male society finches may successfully foster chicks, but the greatest success is usually gained by using a male-female pair of societies. You may need to set up multiple pairs for fostering8 to increase your chances for success. Be sure to feed your foster pairs an adequate diet for breeding just as you are feeding your other pairs for breeding. If transferring eggs, allow the biological parents to finish the clutch before you move the eggs into the foster pair's nest. This will improve the chances of the eggs hatching on the same day, which enhances the hatchlings' survival. Replace the foster pair's eggs with the eggs from the biological parents. Each foster pair should only have 4-6 eggs to care for at a time. Too few eggs in the nest may not be enough stimulation or encouragement for the foster pair to begin incubation, so use additional dummy eggs if necessary. On the other hand, too many eggs in the nest are cumbersome and will hinder successful incubation. If possible, only foster fertile eggs. You will need to candle the eggs after they have been incubated by the fosters for several days to make sure that they are still developing correctly. You may also wish to mark the fostered eggs in some way (with a nontoxic marker or dull #2 pencil) to indicate which biological pair they came from. Society or zebra finch eggs can be left in the nest to be incubated along with the fostered eggs (as long as no more than six eggs are present in total), however the parents may preferentially care for their own chicks over the fostered chicks, so it is generally advised to avoid fostering mixed species to a given pair at a time. Solution: Try adding dummy eggs to the clutch to increase the number of eggs present under the foster pair. Birds may not incubate if less than four eggs are present, or may have trouble incubating if more than 6 eggs are present. Problem: Trying to foster chicks to a trio of male society finches. Solution: Although it is possible to transfer the eggs or chicks of various finch species to a pair of society (or zebra) parents,8 mixing species is generally not recommended if it can be avoided. Mixing species can be problematic because some species will grow faster than others, beg louder, and may outcompete the smaller, more quiet chicks. If, however, you need to mix species, just be sure to transfer eggs or chicks of the same 'age' to the foster pair. For example, if all eggs were laid around the same time, they will hatch at about the same time and reduce the risk of complications. Again, limit each foster pair to six eggs at a time.